How do I know what Sign the Full Moon will be in? What to know when the next full moon will be? Our sister site - Moon Tracks Astrology has the scoop! The Full Moon's timing along with the Astrological sign seem to be a very confusing concept for a lot of people. I receive at least six letters each year asking about the Moon events and their relation to the astrological signs. At the most simplistic description, the sign that the Full Moon will be in during any month will be opposite of the Solar sign that the Sun is in. That's the first noticeable and most obvious factor of the Full Moon through the signs. However, without a full understanding of how the zodiac signs line up with the calendar and the movement of the Sun and Moon, that simple explanation could be meaningless. Before we go any farther, let's back up a little, we can always determine the sign of the New Moon based on the Solar Sign (the sign that the Sun is in) during that portion of the month. The first 3/4 of the month is one sign, and the last 1/4 is in the next sign. So, let's use June as an example. From June 1 through about June 21 (the ending date can vary by a day from one year to the next) the Solar Sign will always be Gemini, while the rest of the month the Solar Sign will be Cancer. If the New Moon occurs June 1 - June 20, we pretty much know for certain (however, remember that 1-day possible leeway) the New Moon will occur in Gemini. The New Moon is always the Sun and Moon conjunction (lined up in the same region of the zodiac), Similarly, the Solar Eclipse can only occur when the Moon and Sun are forming a conjunction. The difference between a Solar Eclipse and a New Moon is that the Moon is directly between the Earth and the Sun, while that is not the case during the standard New Moon. On the other hand, the Full Moon occurs when the Moon is opposing the Sun (on the opposite side of the Earth from the Sun). Hence, the Full Moon will occur in the opposing sign that the Sun is in. Using June as an example again, if the Sun is in Gemini at the time of the Full Moon, then the Moon's sign will be opposite of Gemini in the sign of Sagittarius. If the Sun has moved into the sign of Cancer at the time of the Full Moon event, then the Full Moon's sign will be Capricorn. 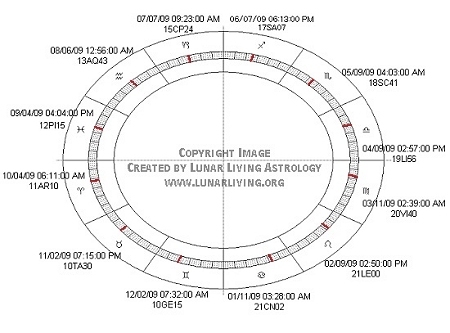 As you begin to see, the calendar dates that we use simply do not line up evenly and precisely with the zodiac's calendar. There will always be the possibility of the New Moon occurring in one of two signs, as well as the Full Moon occurring in one of two opposing signs. Below is a quick table that shows which of the two signs that these Moon events can occur in on any given month. The date of the event determines which sign. Also, depending on the date, the Full Moon degree in the sign is basically determined within the sign. Dates early in the month typically indicate that the degree will be about 10 to 20 degrees. By mid month, the degree will be late in the sign at about 20 - 30 degrees, while the event occurring at the end of the month indicates that the degree will be in the early 0 to 10 degrees of the next sign. The zodiac chart for 2009 showing each Full Moon's date, time (using GMT) and degree/sign/minute also correlates with the table below. The signs are abbreviated to minimize the need to type out the full name of each sign. A quick breakdown of the abbreviation in zodiac order; AR=Aries, TA=Taurus, GE=Gemini, CN=Cancer, LE=Leo, VI=Virgo, LI=Libra, SC=Scorpio, SA=Sagittarius, CP=Capricorn, AQ=Aquarius and PI=Pisces. These are fairly standard abbreviations for the 12 signs. The red line represents the degree on the chart for the Full Moon event each month. Remember, each sign has 30 degrees and 12 signs equal 360 degrees. What you begin to see is that all the Full Moon events this year will be within a 10 degree span of each other from the beginning of the year to the end of the year. The Full Moon's movement through each month is more than 360 degrees (a full circle) over a 29.5 day period (Full Moon to Full Moon). In fact the Moon moves the full 360 degrees in about 27 days and has the opportunity to move about 30 more degrees during the remaining 2.5 days before the next Full Moon. 02/09/09 02:50:00 PM 29.46 21LE00 390.0 deg. 04/09/09 02:57:00 PM 29.51 19LI56 389.0 deg. 12/02/09 07:32:00 AM 29.51 10GE15 390.0 deg. 12/31/09 07:14:00 PM 29.49 10CN15 390.0 deg. Hopefully, this explanation with charts and tables will give you a better understanding of zodiac sign, month and Full Moon event spacing to help you comprehend that the patterns are fairly consistent and persistent, one month to the next, albeit not precise. The Full Moon (as well as the New Moon) events have to follow certain rules based on the day, the month and the astrological sign that the event occurs within.